and tools that you can use to grow your own business in the other chapters. Enjoy! You may have missed: 10 most effective strategies to double your sales without spending a lot of money on promotion in Chapter 6. According to Business Insider, about $4 trillion worth of merchandise was abandoned in online shopping carts in 2015, and we bet that the amount only rises higher year over year. Of that, 63% is potentially recoverable by savvy online retailers, leaving not much to the large proportion of small and new online sellers. Combating shopping cart abandonment, thus, is much as critical as driving traffic to your online store, or designing an attractive eCommerce website design. In this Chapter, let’s discover 9 shopping cart abandonment solutions for online stores, that are practical and easy to apply to lift up your checkout rate fast. Some highly recommended solutions are provided with tools or examples to help you execute right away on your store. This complete 10-chapter guide takes days to finish. How about downloading an ebook version to read on your Kindle for bedtime reading or while you’re on the train? The checkout is the last step in the conversion funnel from traffic to sales. You may probably know pretty well where your traffic comes from, but to have a solid idea about unobvious points such as where most of your traffic abandon it takes time and efforts to observe and analyze. The way online shoppers interact with an eCommerce website could be anything but straightforward. Shopping cart abandonment can be a collective result of various reasons: low click-through rate from homepage to product pages, low add-to-cart rate on product pages, high abandonment rate at cart page, slow loading time, unresponsiveness on mobile,… You need to clearly isolate the main causes of cart abandonment to effective solve this metric. You should draw out an as detailed conversion funnel from traffic to successful payment as possible to have the full picture of your customer journey. For example, if you can break down steps at checkout page to filling out billing address form, applying coupon codes, adding payment methods, confirming payment, you can identify exactly what obstacle at checkout page stops your customers from finishing their order. Deeply understanding insights about your conversion funnel at every step can help you smartly use eCommerce strategies to reduce shopping cart abandonment rate. According to a Baymard report on cart abandonment reasons, 24% of survey participants said that they abandoned their carts because they couldn’t calculate total order cost up-front, and 61% said that extra costs (shipping, tax, fees) were too high. People is frustrated about all kinds of “fluctuating” surcharges besides the product price. Especially, most of the online shoppers tend to feel outrageous when presented with surprisingly high shipping fees. Thus, being up-front and crystal-clear about the total order cost is critical to reducing shopping cart abandonment. If possible, let them know exactly how much they have to pay even before they enter the checkout process. 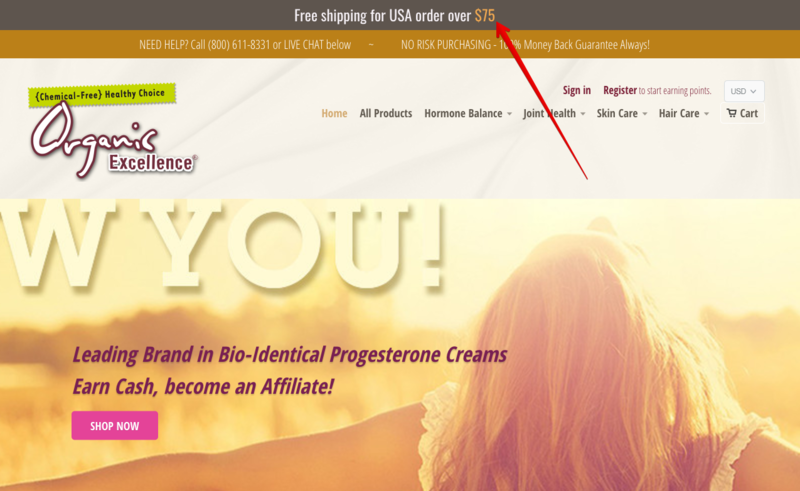 Organic Excellence runs a promotion header bar on the homepage that motivates customers to spend over $75 to receive free shipping. 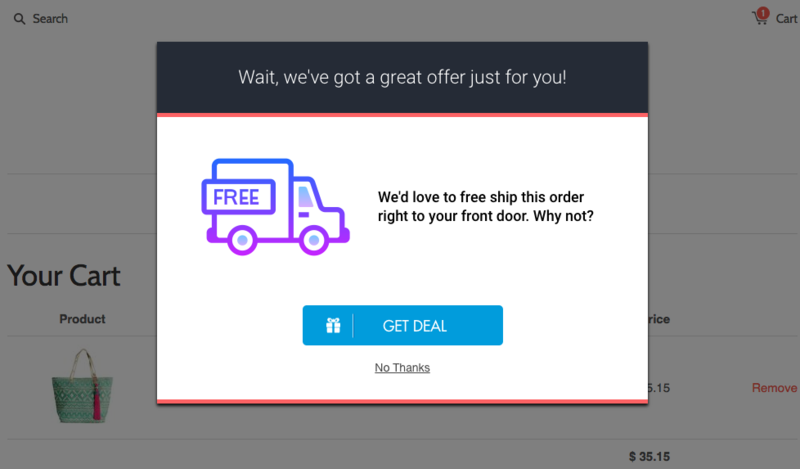 This exit-intent free shipping popup offer is created by Checkout Boost app. A prospective scenario is that you have the email contact of customers who abandon carts on your website. Email marketing can do wonders to save your lost carts and bring back a great amount of money in this situation. Cart abandonment emails are triggered when customers leave the website without finishing cart order. A cart abandonment campaign can be a series of more than 1 email to persistently follow up customers until cart is recovered. According to a report by Salescycle, 46.1% of all cart abandonment emails are opened. Many customers abandon their cart unintentionally due to external incidents such as site crashes, slow load speed or site timeout. These emails are effective in the sales funnel as they remind and lead customers back to the site to complete their order. For those who leave for a reason, you can still convert them back by offering a discount or free shipping code as an incentive. Cart abandonment emails are easy to set up. Or there is no need to set up at all if you take advantage of apps like Mailbot which pre-builds these campaign already and applies big data technology to automatically send out for you. A less positive scenario is that your customers leave without giving you any detail to contact. To follow these customers and get them back to the site, you need to save their cookies while they were in your store and target them with ads when they visit other websites or log in social media, using the same browser. That is called remarketing technique to retarget cookied visitors who previously visited your website, with ads services. Retargeting helps you increase your brand awareness and convert visitors into paying customers. Especial, doing social retargeting on social media platforms like Facebook, Twitter, Linkedin generates better engagement and results since people can like, share and discuss on the ads post, which is shared under your real business account. Suggested tool: Consider trying AdRoll to implement and manage your retargeting campaigns on different platforms: Facebook, the Web, Instagram and on Mobile. Online shoppers will inevitably have questions during their shopping time in your store. They need support about product specs, guarantee, shipping, checkout or sometimes they just simply seek trust by talking to a real staff behind the store. Not only should you make support channels (email, call, chat) visible on your website, but you should also make them instant. Imagine that you’re considering some items on a shop and needed support to choose the best option that suits you. You sent a message via email or live chat but couldn’t get a reply immediately. They reached back to you 12 hours later – at that time you might already forget who they were. Boom! You became their cart abandoner who were interested in making a purchase but couldn’t due to the lack of instant support. When receiving messages from customers, you can chat on your mobile phone anytime anywhere, without logging in a live chat service to be available all the time. Suggested tool: try Quick Facebook Live Chat app to implement a clean Facebook chat box as above. Plus, this tool is totally free! You expect customers to give away email for subscription, fill out transaction forms with their personal identity, and submit credit card information, all online. Though shopping online is becoming a norm now, online security is still, to some extent, doubted. Building trust and authenticity play a vital role in growing your online business, as it helps to remove customers’ hesitation in part with their personal information and make a purchase. There are a few ways to present signs that you are an authentic, secure and trustworthy business. Another great idea is showing visitors that you have many other customers shopping on the store. You can display notifications of recent sales made by real people from real locations, to create a sense of a busy store and build trust in new customers. 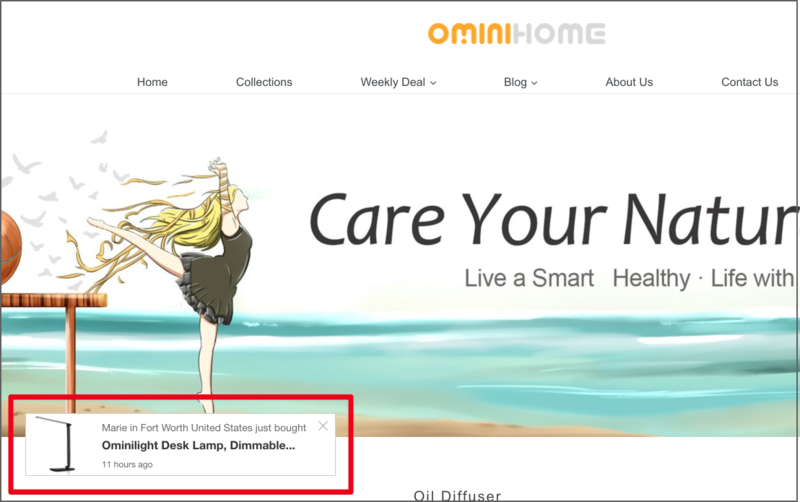 Ominihome store uses Sales Pop app to display notifications of recent orders placed by real people. An optimized eCommerce website design also enhances the professionalism of your store, thus increases trust in customers. 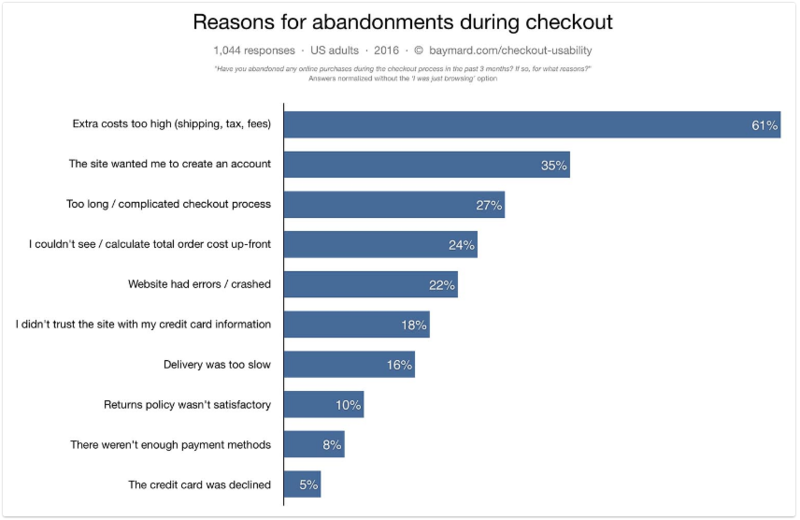 Baymard report also points out that 27% of surveyed online shoppers said they abandoned carts because of too long and complicated checkout process. Optimizing checkout process to be a more simple procedure with flexible options can drastically reduce shopping cart abandonment for your store. Though not a regular case, the situation that customers are interrupted while shopping by external causes such as website crash, emergent incidents sometimes happen, making them leaving your online store with items left in cart. Imagine what happens if when they return and log back, their cart is empty? Chances are that they would already forget shopping with you and leave forever. This is the moment a saving cart feature can help you reduce shopping cart abandonment nicely. This awesome tool Consistent Cart helps to save items in cart till later when customers log back, using different browsers or devices. Offering saving cart options between desktop and mobile devices is a must since more and more customers are performing shopping random activities with their phone but only finish purchases on desktop. When reviewing items in cart, many customers consider more cautiously and rationally. If they realize that some items are much more to their liking than what they really need, they will unhesitantly abandon their cart. At this point, they are so close to making a purchase. Awful news is, approximately 68% of customers drop cart right here, causing online retailers a loss of $4.6 trillion worth of merchandise. What is a feasible shopping cart abandonment solution for you here? Show customers that you have a lot of alternative products they should take into consideration. Not that you will upsell them a washing machine if they are considering a bedside table. Instead, you will recommend products personalized to their interest, based on what they have browsed, searched and added to cart. Suggested tool: Personalized Recommendation app to generate tailored product recommendations on each website page, based on each customer’s behaviors and interests. The ugly truth is that a majority of small and medium online sellers can get a decent traffic but not make good sales, due to the outrageous shopping cart abandonment issue. To effectively solve the root-cause problem, you need to fully and deeply understand why and where your customers abandon their carts. Be clear about your up-front cost, reduce shipping fees as much as possible, streamline the checkout process, offer incentives to motivate checkout, upsell and cross-sell to reveal more product options,…all these methods collectively help you optimize the user experience and improve the checkout rate for your online store. What’s next in Chapter 8: Navigate the best options on how to deliver your products by cutting down supply chain wastage, managing customer returns, and automating your order orchestration. Click here to find out more. Thank you for the article, Daisy. As you mentioned, simplifying the check out process is so important, especially considering so many people are now buying on mobile devices. Stores need certain information in order to be able to process orders, though, so forms are required to a degree. However, we have created a solution that all but eliminates the need for forms. We have constructed a network of eCommerce sites and encourage individual members to form alliances with each other. 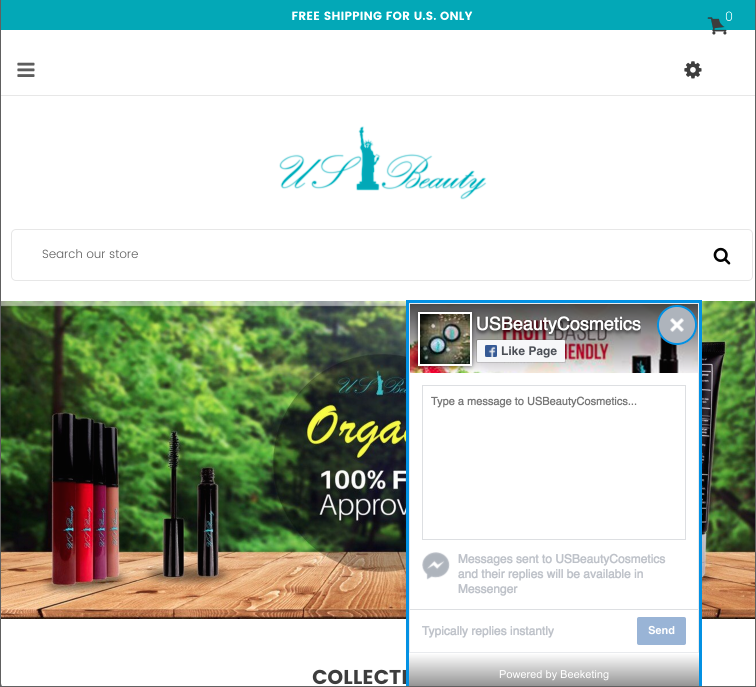 Our platform allows them to display ads for each others’ products with ease. Because the partnerships are carefully selected they are non-intrusive, non-competing and relevant to the customer. With simplification of processes in mind, the partnered stores are able to share their customer’s account details with each other automatically. With the customer’s permission, of course. This means that even when the customer is shopping at a new store for the first time, there is no need for them to fill in forms to open an account. Instead, they are taken directly through the the purchasing page. It’s a solution that helps generate additional revenue and leads for the stores, while simultaneously providing an enhanced experience for their customers.